US Vice President Mike Pence called on Myanmar to immediately release two journalists who were sentenced to seven years' imprisonment on charges of possessing state secrets in connection with their reporting on massacres against Rohingya Muslims. 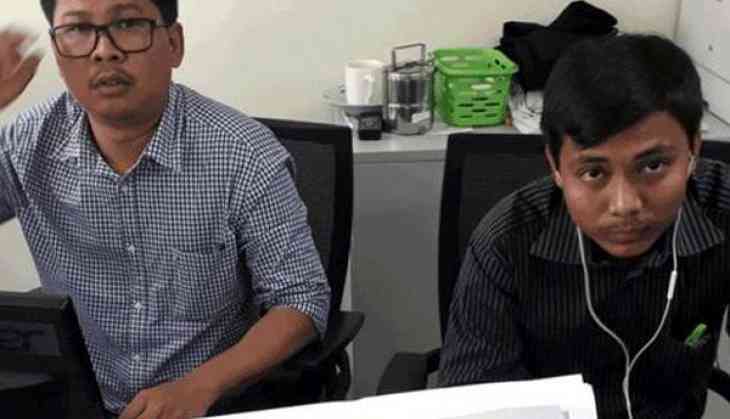 Wa Lone and Kyaw Soe Oo from the Reuters news agency were sentenced Monday in proceedings that were widely decried as unfair. They had reported about the army's brutal counterinsurgency campaign that drove 700,000 Rohingya to flee to Bangladesh. The subject is sensitive in Myanmar because of worldwide condemnation of the military's human rights abuses, which it denies. Pence on Tuesday tweeted the two should be "commended not imprisoned for their work exposing human rights violations & mass killings." "Freedom of religion & freedom of the press are essential to a strong democracy," he wrote in back-to-back tweets. "We call on the Gov't of Burma to reverse this ruling & release them immediately." UN Secretary-General Antonio Guterres also urged Myanmar authorities to review their decision, noting with concern the conviction and sentencing of the two. "The right to freedom of expression and information is a cornerstone of any democracy. It is unacceptable that these journalists were prosecuted for reporting on major human rights violations against the Rohingya in Rakhine state," Guterres' spokesman, Stephane Dujarric, said in a statement. The case drew worldwide attention as an example of how democratic reforms in long-isolated Myanmar have stalled under Nobel Peace laurate Aung San Suu Kyi's civilian government, which took power in 2016. Although the military, which ruled Myanmar for a half-century, maintains control of several key ministries, Suu Kyi's rise to government leader had raised hopes for an accelerated transition to full democracy, and her stance on the Rohingya crisis has disappointed many former admirers. Wa Lone's wife, Pan Ei Mon, told reporters that she was saddened and hurt that Suu Kyi had taken a legalistic position in a June interview with Japanese broadcaster NHK by saying that the two reporters were arrested for breaking the Official Secret Act, not because they exposed the army's abuses. "I am very sad about what she answered because she was the one whom we always admired and respected," Pan Ei Mon said Tuesday. "We loved and respected her so much," she said. "We feel very sad as our respected person has the wrong opinion about us." She said that she never expected such a harsh punishment "because everyone knows that they didn't do anything wrong." The two men testified that they had been framed by the police. Pan Ei Mon gave birth to the couple's first child in Yangon on August 10, but her husband has not seen their daughter. "After I gave birth, I continued to keep strong with the hope that my daughter and her father will meet soon. But I felt like my hope was broken after the verdict yesterday. I am hopeless now," she said. Kyaw Soe Oo's wife, Chit Su, also said she had expected her husband would be coming home. They have a 3-year-old daughter. "I believed he would be free, he felt the same," she said. "But it didn't happen, I felt like I am a crazy person." She said she still hopes for mercy from the state. At the same time, she remains proud that her husband did his duty as a journalist.